Be the first to share your favorite memory, photo or story of Fredy. This memorial page is dedicated for family, friends and future generations to celebrate the life of their loved one. 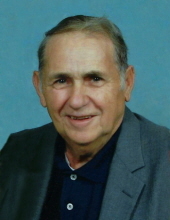 Mr. Fredy Lee Ruppe, 87 of Red Hill, died Tuesday, October 30, 2018 in Lanesville, IN. He was born in Harlan, KY on July 11, 1931 the son of John Washington and Mary Elizabeth Pittman Ruppe. He was a retired purchasing agent for L&N Railroad and a member of Red Hill Baptist Church. He was a member of the Highland Park Masonic Lodge and was a US Air Force veteran of the Korean War. He is survived by his wife, Anna Marie Anderson Ruppe; two sons, David Ruppe and wife Becky of Lanesville, IN, and Rex Langston of Bowling Green; three daughters, Vicky Ruppe and Shane Ware of Somerset, Kimberly Brinson and William Singleton of Livingston, and Kathy Morgan of Clarksville, IN; a sister, Lois Mullins of Frankfort; seven grandchildren, Shelly Looney, Migon Looney, Katie Ruppe, Devin Ruppe, Johnathon Ruppe, Madison Ruppe, and Mary Brinson; and six great grandchildren, Gavin Spoonamore, David Spoonamore, Jadon Wilkins, Clair Ruppe, Martez Hill, and Chyanne Foster. In addition to his parents, he was preceded in death by four brothers, William, Burton, Robert, and Eugene Ruppe; and a sister, Minnie Garner. To plant a tree in memory of Fredy Lee Ruppe, please visit our Tribute Store. "Email Address" would like to share the life celebration of Fredy Lee Ruppe. Click on the "link" to go to share a favorite memory or leave a condolence message for the family.